Tired of your Khajiit speaking the Queen's English? It drives this one crazy! The main difference is that rather than being a language pack, this addon alters the text programmatically. The up-side of this is that you'll never bump into content that isn't translated and it can be enabled on a per character basis. By default the addon only enables for Khajiit characters, though you can toggle it on or off at will for each character independently. 1. While playing, hit Escape and choose "Settings" followed by "Addon Settings"
2. In the window that pops up, choose "Khajiit Speak"
3. Configure to your hearts content. Handy tooltips will explain each option for you. /ks - Prints a list of commands, and explains how to use them. /ks conf - Prints a list of config commands, and explains how to use them. The addon should be completely compatible with any other that alters the look of the dialog UI, so feel free to mix this with other addons. On the off chance that any incompatibilities are found, feel free to let me know. errors that I've not come across, and thus not been able to fix. Should you find any errors in the grammar, please DO let me know so I can fix them in future versions. Please ensure you're using the latest version first, and include the exact line of text when reporting issues, so I know what I'm looking for. I would like to thank Matt, creator of the original Khajiit Speak Mod for Skyrim. as well as helping me find the issues already contained within it. ├Updated LAM to 2.0 r26. └Updated to API version 100024 and tested. ├Updated LAM to 2.0 r25. This fixes incompatibilities with the config menu and the most recent ESO update. └Updated to API version 100021 and tested. ├Removed line of debug. Zoops. ├Implemented nickname system doodad. Hooray! ├Re-organized LAM settings page, hopefully it's less confusing now. ├Fixed an issue with flip-aroundy questions. └Fixed numerous generic grammatical issues/missing fragments. Too many to bother listing. Like, seriously; loads! ├Added missing fragment exception: "may"
├Added blanket replace for "Me either." 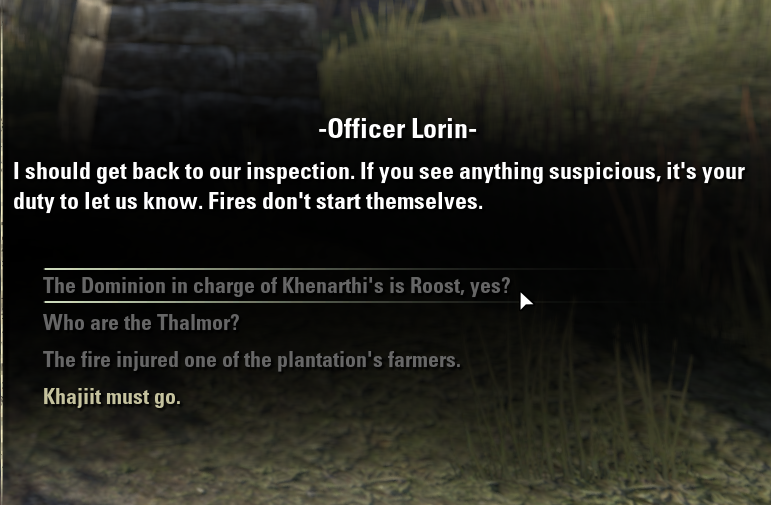 -> "<Khajiit> does not either." 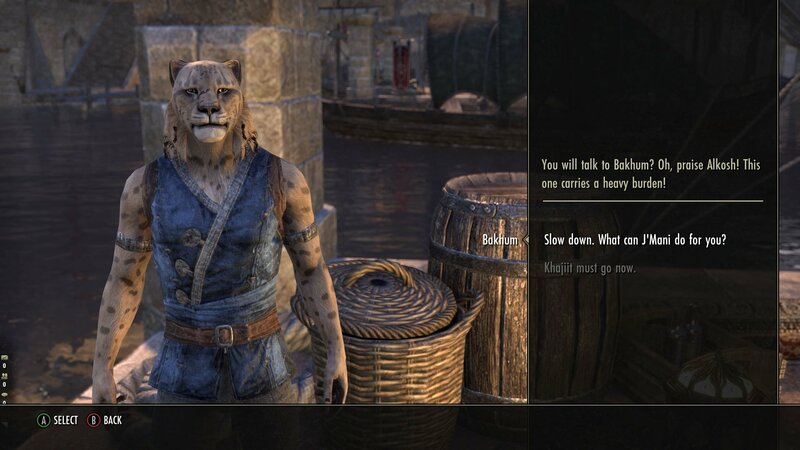 │ "Khajiit either" didn't really sound right. Also handles "neither." └Fixed the crap out of fliparound-y type questions. ├Added "wouldn't" to the contraction conversion stack. ├Added an option to toggle "you" -> "it" replacement specifically. Now called "Impolite Pronouns"
│ This feature is no longer toggled with word subbing. Instead all it requires is line weighting enabled. ├Added a list of two word references to use in contraction conversation in order fix lines such as: "Why has the Dark not Brotherhood contacted me already." ├Moved Impolite Pronouns into the pronoun stack, so that preceding and following words are formatted properly. ├Dynamic goodbye line pronoun selection is now weighted by the lineWeight of the line above it. └Fixed "get" exemption from nextword. Get is a weird word. It now works correctly whether transitive or not. ├Added three new dynamic goodbye lines. ├Added a new random word sub: "Thanks"/"Thank you" -> "Khajiit thanks you"
├Added some more words to the weighting system. │ If line weight is negative (and thus on,) word subbing will swap out any "you" for "it". │ This does stuff like: "I wish you wouldn't do that." 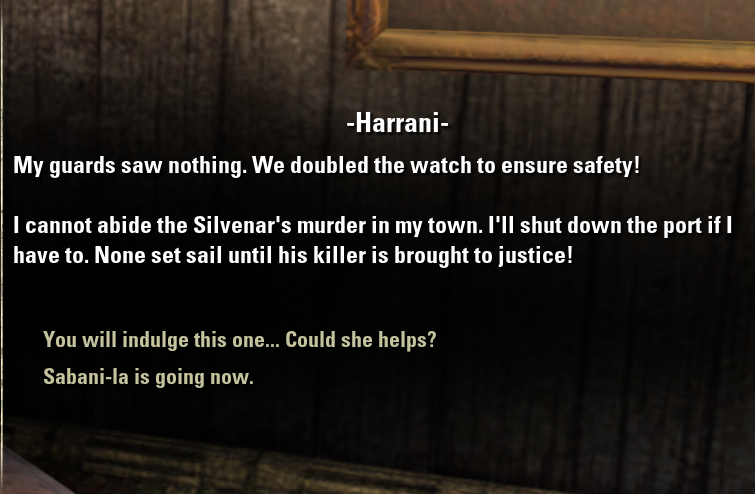 -> "Khajiit wishes it would not do that." │ One thing I've always loved about the Khajiit is how they refer to unfamiliar or unfriendly people as "it,"
│ this is my attempt to integrate that in some small way, and if successful, may be expanded upon. │ In testing this has had some great results, but it could cause issues in unforeseen ways. ├Moved blanket word replacements inline with random word subbing, semantics really. ├Fixed random word substitutions matching to the middle of words. Oops. ├Added some new question fluff, the more the merrier. ├Added some new dynamic goodbye lines. ├Added more entries to the blanket replace list. Now all applicable Daedra use their Khajiiti names. Yay! ├Added the groundworks for random word substitution. │ For now this does very little, but more will be added to it as appropriate substitutions are found. ├Added the long desired line weighting feature. Pronoun choice is now more than purely random. ├Updated yes/no modification to allow it to replace a little more liberally. Should see these more often. ├Minor grammar fixes to do with words ending in "pt", "ft", and "ll"
├Fixed an old issue with "can't" and "won't" cropping back up since 1.04. ├Fixed a rare issue with fixing up the word "do" that would cause this: "Khajiit has something to does, he will etc.."
├Fixed missing fragment exception "already"
└Did a pretty hefty round of optimizing. ├Updated to API version 100015. ├Altered personal pronoun sweep to allow to for next word checking. ├Disallowed pronoun changing before an honorific title. "my Queen" and similar will now be ignored. ├Fixed a typo that was preventing "Where's" from being un-contracted. ├Added "can" questions to the... Question-ifier. ├Altered goodbye line seed slightly to ensure it generates the same whether on gamepad UI or not. ├Fixed a rare issue that would cause odd grammar with question parsing, such as: "The Queen well, is yes?" └Fixed a bunch of minor grammar errors that I've been saving up over time. └Gamepad UI now supported! Hooray. ├Updated to API version 100014. ├Removed a bunch of stuff from global/string scope. ├Made static goodbye line actually static when it comes to pronoun. That's how it was supposed to be. Oops. └Removed another question suffix. Cramming another question into a line containing a question didn't really sit right. ├Updated LibAddonMenu to r17. Derp. ├Fixed old logic from before API 100011 in the toggle command causing bad things to happen. Again, derp. ├Updated to API version 100011. Previous releases will not work on this API version. ├Added settings menu through LibAddonMenu. ├Removed a question fluff. Khajiit was seeming too apologetic. ├Tweaked question fluff to remove some combinations that didn't really work. ├Fixed grammar issue with "sk". Eg; "Khajiit ask..." -> "Khajiit asks..."
├Fixed "n't" contractions and "the". Eg; "Can not the Dominion do it?" -> "Can the Dominion not do it?" ├Fixed a grammar issue with the word 'wield'... Again. ├Updated the damn API version number. ├Fixed an issue with ', yes?' questions formatting incorrectly. Eg. "The are blades here really worth that aggravation, yes?" ├Fixed an issue with contraction conversion: "This one will do not that." -> "This one will not do that." ├Fixed another miscellaneous issue with contractions causing things like: "Your husband is here not." ├Fixed another error with punctuation in contraction conversion. ├Disallowed fluff to be inserted if the line starts with quotations. ├Added 'worry' to the fragment list. ├Various fixes to issues regarding contractions and 'yes?' questions in sentences containing punctuation. ├Halved the chance of yes/no fluff. ├Fixed some fragment typos from optimization. ├Fixed issues where words at the start of a sentence counted as a fragment exception. ├Fixed an issue in parsing 'ed' words. ├Disallowed question fluff text from being inserted into the middle of a line. Should help keep the flow as originally intended. ├Changed the fluff chance default back up to 33% due to the much stricter matching rules. ├Fixed a rare UI error with 'Yes.' replacements. Thanks again to Nayolan for pointing it out. ├Fixed the dreaded double 'H' error that's been plaguing us since a very early version. Thanks to Kouroth for report. ├Made third party pronoun replacement much more intelligent as to when it's actually used. ├Fixed more grammatical issues with the new third party pronoun replacement. ├Added detection for whether an "'s" contraction should be "is" or "has"
├A few little optimizations here and there. ├Added a missing fragment exception for 'do'. eg; "Why does Khajiit has to" -> "Why does Khajiit have to"
├Same again, but for 'would'. └Added hope that this will be the last update for at least a week or so. ├Fixed the major UI error in the new question formatting code. I'm a moron. Thanks to Nayolan for pointing it out. ├Fixed some incorrect fragment exceptions. └More grammar fixed, of course. Always grammar fixed, I should just stop including this note. ├Added 'you'll' to contraction conversion stack. ├Fixed an issue causing some fragments to format contractions incorrectly. ├Fixed a capitalization issue relating to fluff being inserted into one word questions such as: "How?" ├Made fluff text ending in "..." reset the he/she tracking to force a full pronoun after them. ├More alterations to fluff text, as well as some additions. ├Re-worked non-pronoun word alteration to fix rare issues such as: "How will Khajiit knows?" ├Added yet more words that can trigger ', yes?' type question formatting. ├Added the word placement detection method from contractions to 'yes?' questions. │ This fixes things like: "The are Wood Elves here, yes?" -> "The Wood Elves are here, yes?" ├Disallowed the 'Khajiit' pronoun to be chosen if the word 'Khajiit' has already been used in the original text. ├Fixed the 'useRace' and 'useName' options occasionally being ignored by pronoun generation. ├Made the addon replace existing 'he/she/him/her/his/hers' with 'that one/them/their' if needed. ├Fixed rareish UI error relating to inserting fluff into one-word questions. ├Fixed a capitalization issue with some fluff string combinations. └Added 'weren't' to the contraction conversion stack. ├Fixed fluffchance command causing a UI error if passed anything other than a number. ├Increased the likelihood of he/she pronouns being used. ├Improved question fluff matching considerably. ├Fixed only a few of the available fluff strings being chosen for insertion. ├Reworked some of the fluff text to hopefully make it blend in more. ├Added a little randomization into the fluff text itself, should help keep it from feeling too repetitive. ├Completely rewrote "n't" contraction conversion. Works much better now, as well as being more efficient. ├Added a few new detection methods for ", yes?" type questions. These should show up a little more often. ├Fixed an issue with ", yes?" type questions matching to negatives and making no sense. ├Removed some unreachable code. Wasn't doing anything but taking up space. ├Removed a function that is no longer used. ├Slight optimization of the pronoun replacement workflow. └More grammar fixes, as a bonus. I feel bad uploading so many damn patches that are just small fixes. ├Randomization has been fixed! The addon no longer favors "This one" over the others. ├Randomization improved. Now seeded from the sum of the line characters' byte codes, rather than the line length. ├Fluff text altered to create less run-on sentences. ├Fluff text insertion matching is now more strict. └Fixed a huge bug in the fluffchance command, this command is now usable again. My bad. ├Fixed a capitalization issue due to a missing fragment. └Two question bugfixes with one change! No more weird comma formatting. ├Fixed dodgy randomization seeding due to the new workflow. ├Moved some missed code into the new workflow. └Fixed an issue with the "X is Y, yes?" type question formatting. └Fixed an extremely rare but severe UI Error that would halt dialog progress. ├Whole new command system, readme removed. Don't need it anymore. ├Lots of improvements to the conversion workflow. └Fixed a reported grammar issue. Will this be updated anytime soon? Either by the author or someone else, would appreciate it! Yeah, can't wait for the update too! Update 3.3 (Dragon Bones) is out, so the plugin now shows as being out of date. "Allow out of date addons" enables it to work properly, so API probably wasn't broken. Bump supported version? 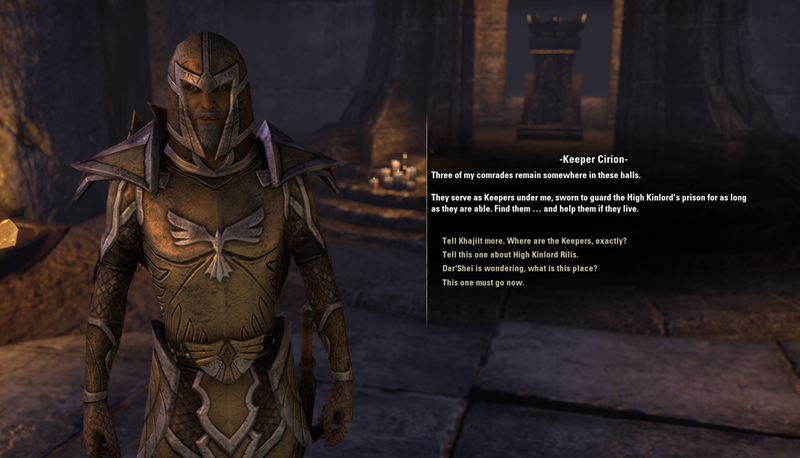 I have noticed far too many Khajiit Speak misspellings and grammar errors to screenshot them all and comment them all. I would like to offer assistance in correcting them as I am sure you have other things to do than stalk the pc all day. Please feel free to message me and let me know. Last edited by Kitty Khajt : 01/29/18 at 07:19 AM. Hi, I also noticed a small interpretation error. A funny one in the Thieves Guild DLC. Interestingly, in other cases in which the character mentions No Shira Citadel the "no" is not replaced. Seems like Clockwork City update broke addon settings UI (latest LibAddonMenu was already fixed to address that, so could just pull the fresh one into the addon), plus the addon is now marked as outdated and disabled by default. And thanks for great job with Khajiit Speak, really adds proper atmosphere to the game. Thanks for letting me know. Pushed out another emergency update that fixes this. I should be able to get back onto content and grammar fix updates soon. I've been stupidly busy lately. Last edited by Diriel : 11/02/17 at 06:26 AM. Last edited by Thyl : 10/29/17 at 11:03 AM. Hello people! Sorry for the absence, switched to a new email address and completely forgot to update it on ESOUI, so I've not been informed of feedback. Derp. I'll have that fixed right away. Thanks for the grammar reports. I'm going to do a quick emergency update (late as it is) to get rid of the issue that GarouX told me about, but I've added all of those to my list for the next actual update after that. It looks like with the latest update, there's a debug line left active on line 680: "d(nxtWrd)". It's making certain NPCs "speak" a word into the chat box, but commenting that line fixes it. Last edited by Circuitous : 11/30/16 at 10:33 AM. As always, I love this addon! Thank you so much for making it! Glad you're enjoying the addon. I left it commented out because it basically scanned the chatbox each time you entered a new character and looked for a certain trigger, I think it was "!ks". Upon finding this trigger, it would format everything before it, then remove it. I didn't actually intend to stop including this disabled by default feature, it just kind of fell off the radar at some point. I may add the commented out function back in with the next update, that way those few that do want this feature can still access it with a little effort. 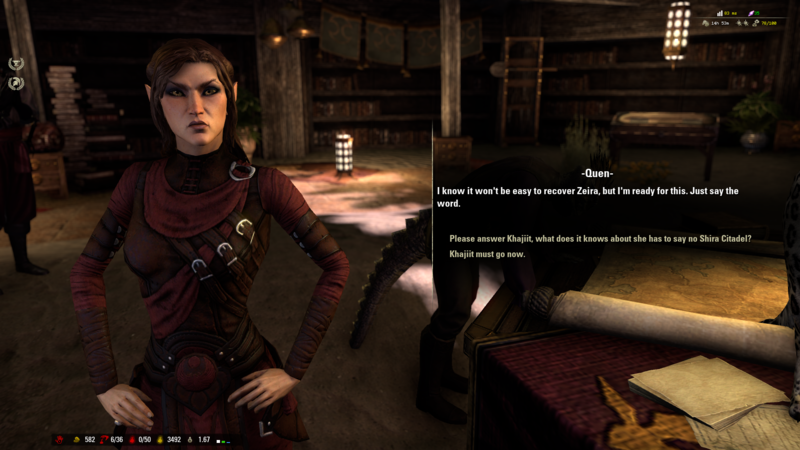 Just an odd idea: What about a spin off addon that lets you type in normal English sentences and the spits out into /say or what ever channel a Khajiit speak version of what you said. It might be a fair bit of work but could be a big boon for RP'n. 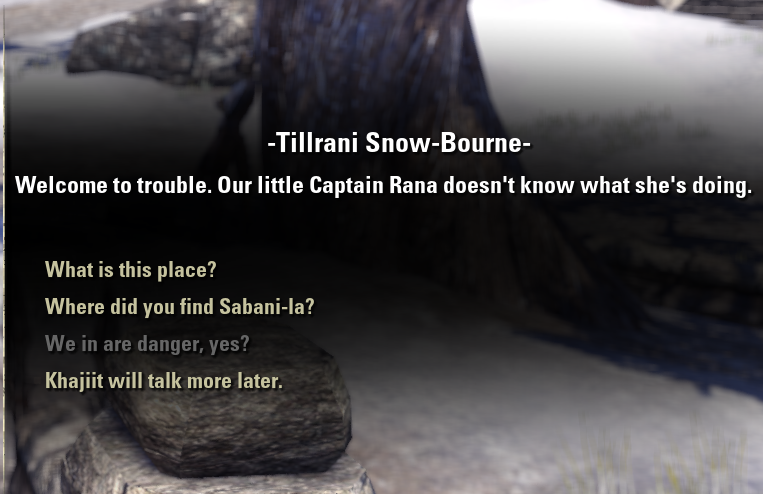 Especially those of us who are some times a bit Khajiit speak challenged. I'd guess you've done most of the hard work for something like that already with this addon. It'd be cool if you could add in the ability to strip away honorifics such as J', Ra' etc from your speech. That'd be cool as it seems odd for someone to refer to themselves as 'Sir <name>' or 'Dr <name>' unless they are introducing themselves formally. In most conversations your character isn't speaking formally. This would actually be a really easy feature to implement. Though in my experience, the Khajiit consider their honorific title as an actual part of their name. 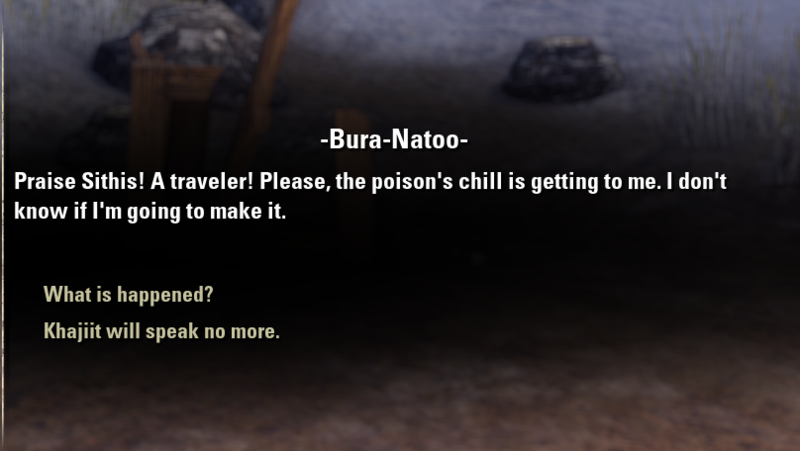 For an in ESO example, Razum-dar always refers to himself as either "Razum-dar" or "Raz" to the player. So I suppose what I could do is add an optional nickname field in the addon-on's config that'll replace the full name when the line weight is heavily positive. Last edited by Diriel : 08/27/16 at 12:31 PM.